The grease and grime of the day sometimes leave behind a nasty, oily sheen. Ever look at yourself in pictures and just wish you'd had blotting linens with you for a quick touchup pre photo? 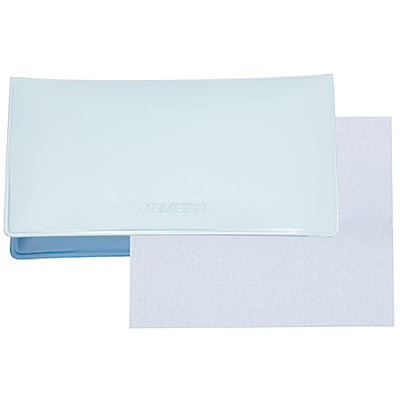 Well, with Shiseido Pureness Oil-Control Blotting Paper, your prayers are answered. The pale blue plastic pouch contains 100 sheets that remove so much oil from your face, you'll actually be surprised there was that much to spare! One side of each sheet is coated with anti-bacterial powder that helps to keep skin pure. One thing's for sure -- I won't be leaving home without these blotting papers ever again! Shiseido Pureness Oil-Control Blotting Paper retails for $18 at sephora.com.